I stopped by CVS today hoping to get the $7 off $15 Revlon coupon (I didn't get it) but I did get a few Maybelline items, L'Oreal Lash Boosting Serum, and these 2 Mentos and Tic Tac packs. I'm not blogging about the rest of my purchase because I didn't really get any great deals (mainly used rain checks and newspaper coupons) but I wanted to share this. It was a 2 for $5 deal which I think is really good. 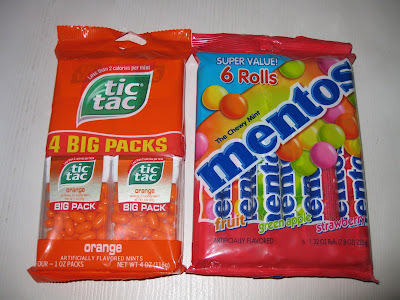 Individually, Mentos and Tic Tacs sell for around $1.30-$1.40 a piece so this is a steal for 4 Tic Tac boxes and 6 Mentos rolls for just $5! My whole family looooves mentos,I like the orange flavor which one is your favourite? I like the yellow one (is it lemon? or banana?) and the pink (strawberry I think.) I just tried the green apple today though and I love it! Oh! Good to know. =P Mentos are so yummy. @ Pink.. You're welcome =) Hope you find it at your CVS! @ Pop Champagne.. LOL I've been eating them ALLL day.. I've already finished 2 rolls since I got them last night!